We revisited bundled stamping, this time we made prints with bundled pencils! Bundle up pencils with rubber bands so that the erasers form a flower shape. Press on stamping pad and Stamp on paper! The bundle stamp can be used for making cards and pretty homemade gift wrap paper! Some Dots are Bunchy and Yummy! I love the grape vine art! For Book + craft, we are reading our favorite book. Please read my other post to find more dot activities to go along with the book. Oh this is fantastic-- my daughter would love it! Wow! Fabulous! These look really great! Clever you! 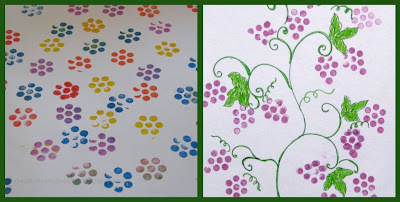 Looks great fun - I like the grapes as well and could see them making a great wrapping paper to create into a wine gift bag for thank you gifts for helpers in my classroom when I return to teaching. so fun & sounds like a great book. I really love how you use different items in your art! Always so creative & fun! So cool! I shared this on fb and twitter. Can't wait to try it. Very very very creative... Loved the idea a lot ! Great idea! I think my daughter would love to do this...simple, yet I would have never thought of it. Love ideas that don't involve fancy supplies! What a cute idea. I will definitely have to try that! oh wow!! fantastic.. so so pretty!! Such a great idea with neat results! Such clever art! Really innovative! Must try with my girls ...I know they will be giggling with glee! haha what a great idea!!! Fun idea! Love the grapes! What an awesome idea, it comes out looking great! And it opens up to so many more things to do with pencils/erasers as stamps, thanks so much! Very creative and I love that is it using items you already have (pencils) My boys would love this. I hope you will share this on my mommy solution meme! I love this one too! So cute. love it! thanks so much for sharing on Craft Schooling Sunday! What a simple, but clever idea! Can't wait to give it a try! That is so clever - love it and off to try it myself now... well at least off to try and find some pencils first! Thanks for sharing! How very clever. So simple and so effective. What a lovely yet simple idea. I can't believe you made these with erasers. So pretty! Just pinned!